Book your Semper Opera Tickets now! Exclusive offers for the State Operetta! The story of the State Operetta Dresden! Find out more about the history of the State Operetta! Experience a weekend full of culture and art! Book tickets for Sempera Opera House! Learn more about our terms of business! The Semper Opera Dresden is due to its wealth of artists and guests from all over the world “a mirror of the aesthetic wealth of international music theatre and ballet work“ (Semper Opera – History of the Semper Opera). As one of Europe’s leading operas, the Semper Opera offers a wide repertory of opera and ballet performances. Besides classics like ‘The Knight of the Rose‘, the Christmas ballet show ‘The Nutcracker‘ and ‘The Magic Flute‘, less well-known productions are also on the programme. In 2014, e.g. ‘Feuersnot‘ (‘The Need for Fire‘),‘Guntram‘ and ‘Salome‘ are on to commemorate Richard Strauss‘ 150th birthday. The previous year, 2013, was dedicated to Richard Wagner as it was his 200th birthday. He spent several years in Dresden as Royal Saxon Court Conductor and influenced the history of opera in Dresden considerably. ‘The Flying Dutchman‘,‘ Tristan und Isolde‘ and ‘La juive‘ are but a few of the masterpieces that are on the programme of the Semper Opera in his honour. The State Operetta Dresden is in no way inferior. Not only classical operettas like ‘The Bat‘,‘A Night in Venice‘ or ‘La Vie Parisienne‘ are performed, but also musicals and opera-bouffe. Of course compact tours gives you the chance to combine and book performances with other services in a package. Besides tickets for the Semper Opera and the State Operetta Dresden, we offer tours of the city, tickets for museums and other touristic services together with hotel accommodation. Or maybe you will choose one of the packages we have prepared? Whether you are planning a short break in Dresden or want to enjoy a cultural weekend – there is something for every one. Let yourself be enthralled by our short city tour and experience unforgettable moments and culture in Dresden in one of the most beautiful opera houses in Europe. 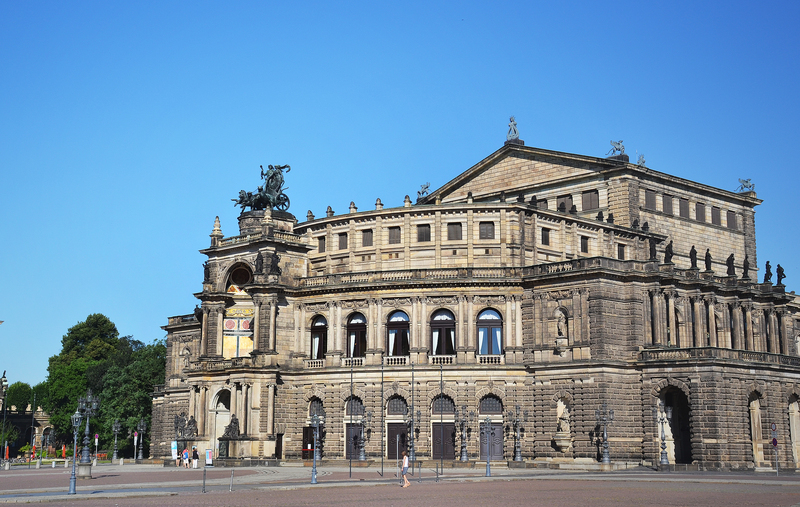 Booking your tickets for the Semper Opera and State Operetta Dresden is fast and easy if you use our online booking system, and then you will be able to look forward to your short break in Dresden. We are member of the campaign Service Qualität Deutschland to improve the services of german companies. We have signed the Code of Concuct for client-orientated online-marketing. Securely encrypted transmission of all information via SSL. Save your precious time and let us at Compact Tours prepare a tailor-made offer for you – in all aspects a professional tour operator. Nowadays about 35,000 guests a year rely on the services of our company, among others also well-known major tour operators like TUI, airtours and Ameropa. And what about you? We won’t be satisfied if we don’t disappoint you. Compact Tours wants to inspire you! Help us to succeed by challenging us. Our quarterly, free newsletter will inform you exclusively about the most important classical music highlights of the year!